If the adage "you're only as sick as your secrets" held true for Kirsten Shultz and Amanda Seaward, they probably should be dead by now. The two, brought together last year over wedding preparations for Pauline Montupet and Peter Shanley's Sun Valley wedding, were in the running to be featured in an upcoming Martha Stewart's Real Weddings special issue, and while the possibility alone was shout-from-the-mountaintops worthy, Shultz especially had to keep it on the down low. It all started about two years ago when Montupet and Shanley decided to hold their wedding in the same place they got engaged. The couple both loved the area before they knew each other and settled on Trail Creek Cabin as the site for their July 16, 2011 nuptials. Working from a list of vendors provided by Sun Valley Resort, Montupet made her way to Bellevue photographer Shultz. "I loved Kirsten's work from the start," she said. "And I went to meet her and it just clicked. I'm not used to being in front of the camera and she just made me feel so comfortable." Montupet is a popular wardrobe stylist living in San Francisco. She has worked with some of America's best designers, including the Gap, Banana Republic, Piperlime.com, Dockers and others. A good friend's sister worked for Martha Stewart's wedding division and she encouraged Montupet to share her wedding plans and see if there was interest in a feature article. Next on board was Seaward, a wedding planner from Bellevue. "I had a pretty clear vision of what I wanted for the wedding as far as look and feel," the bride said. "And Peter had a strong voice about certain aspects like the music and the food. We wanted it to be pretty casual, but also have a traditional feel. Certain things were easier than others. My wedding dress was the only one I tried on, but doing table seating? That I needed some support with!" As things began taking shape with Seaward's guidance, Montupet continued sending pictorial updates to the magazine. For Shultz, the first obstacle was securing the exclusive role of shooting the wedding. "They only choose maybe 10 weddings [for the issue] and they often send their own photographers," she said. "When they decided not to send anyone out, I thought, 'Oh my god, I just passed the test, now I have to make it happen.'" Seaward had the challenge of making sure that what Shultz had to work with was compelling enough too. Admitting a fairly controlling nature, Montupet said Seaward's similar attention to detail and sense of organization as well as her creativity and resourcefulness allowed her to let go in the days before the wedding. "I was so stress-free the day of the wedding since I knew she was there taking care of things," Montupet said. 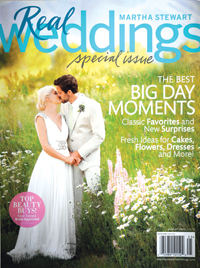 Shultz said the wedding "was all about the bride's vision and her style, which is why the magazine was interested." "Amanda was really great and made sure everything ran smoothly so we passed the next test," she said. Seaward called being on Martha's radar "the biggest honor a wedding planner can have." "I wanted to shout it from the rooftops," she said. "Who doesn't want to share news like that?" Once the wedding was successfully accomplished, Shultz continued working with the editors and artists. Finally, as the magazine deadline to print drew close, Shultz got word that in addition to the wedding being featured, one of her photographs was chosen for the cover. Shultz said the irony is that as a starting photojournalist, she used to eschew the idea of shooting weddings, though she had an interest in high fashion. Ultimately, the way that Martha Stewart showcased weddings appealed to both of Shultz's points of emphasis, and so it became a beacon to aim for professionally. She was in Los Angeles when the magazine went live on the Internet, and people began to call to congratulate her. "I had kept it under wraps for 12 months, then people saw it online and I couldn't bring myself to look online. I ending up walking five miles to get a hard copy to see it in print." Montupet, now Shanley, has been back to Sun Valley to visit since the wedding, and plans to celebrate the first anniversary here this summer, but she joked on her website that "Peter and I tied the knot and made it official last summer, but now this really makes it official, the cover of Martha Stewart Weddings!" Seaward said this is a win for the entire valley. "It's one of those things where you are grinning ear to ear, not just for yourself, but for all of us," she said. "It puts Sun Valley on the map for spectacular destination weddings. It was such a group effort and it's fantastic to see everyone get the credit they are due."